Set in it's own extensive tree lined grounds, Howard and Linda created the cottage style B&B accommodation for those who are looking for that perfect relaxing break in open countryside, yet very conveniently located to the centre of Stanhope (1.4 miles), local amenities, and the C2C cycle route. We take pride in providing quality, private B&B accommodation, with beautiful panoramic views across Weardale. A perfect place for walking and cycling holidays. Four Double rooms, including a four-poster bed. One Twin Room - two single beds with walk-in shower. All rooms include a TV, sofa or chairs, tea and coffee making facilities. Wi-Fi internet is available in the breakfast room. We are a BT Fon Hotspot. If you are part of the BT FON Wi-Fi Community you will be able to access the Internet for free from the Breakfast Room. If not usage of the accommodations broadband is charged at £5 per 5GB. Sitting areas with beautiful views. Free fishing at our B&B's small carp pond. Four pegs. Secure cycle storage. Selection of free cycle spare parts. Cycle washing facilities. Rates start from £62.00 per room for a twin/double room. No children under 14 years. No pets. Twin room suitable for guests with restricted mobility. The place to relax and unwind in a tranquil environment. Disabled Facilities: There are disabled facilities. Purpose built twin room with specialist sanitary fittings including walk in shower. In 2007, the B&B accommodation was awarded a commendation for access from Durham County Council in the Small and Medium Enterprises Category. Nominated by Anne Cowie, of the Wear Valley Disability Access Forum Ltd, who commented " The owners have provided the only accessible bed & breakfast accessible accommodation not only in Weardale but the whole of the Wear Valley." Take the A689 through Wolsingham and Frosterley to Stanhope: Upon entering Stanhope at the Texaco garage, proceed on the main street (A689) for one mile. Just past Stanhope Old Hall, is a junction signed B6278 - Barnard Castle, Eggleston. Opposite this junction, there is a single track 'no through road'. Turn right there and proceed for 0.75 mile and Belle Vue Farm is the first entrance on the left. 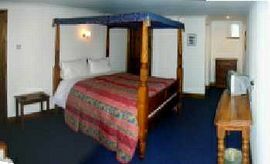 From: £63.00 per night for a twin/double room. A non-refundable deposit of £30.00 per room per night is required, with the balance due upon arrival. Room availability is from 4:00 p.m. to 10:00 a.m.
No children under 14 yrs. In 2007, the B and B accommodation was awarded a commendation for access from Durham County Council in the Small and Medium Enterprises Category. Nominated by Anne Cowie, of the Wear Valley Disability Access Forum Ltd, who commented " The owners have provided the only accessible bed and breakfast accessible accommodation not only in Weardale but the whole of the Wear Valley."